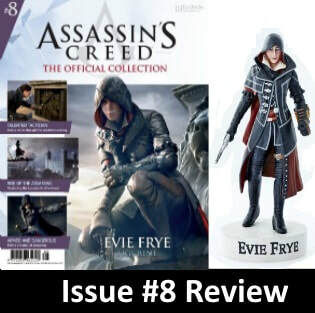 Our Admin, Col_96 has kindly been given the opportunity to review issues of Assassin's Creed: The Official Collection. Hachette and Ubisoft have come together to create "Assassin's Creed: The Official Collection". Developed with Ubisoft, Assassin’s Creed: The Official Collection immerses you in the underground world of Templars and Assassins. The collection takes the form of high-quality scale figurines along with an exclusive magazine exploring the Assassin’s Creed universe, from the Crusades to Victorian London. ​Launching on 22nd February 2017, Assassin’s Creed:The Official Collection brings together all your favourite characters from the celebrated game series, all hand-painted with stunning details and builds to a compelling and comprehensive overview of Ubisoft’s cherished franchise. All figures in the collection are hand painted with stunning details on a 1:21 scale, providing an authentic representation of Ubisoft's most iconic Assassins and Templars. In collaboration with Ubisoft, all the figurines in the collection have been digitally sculpted in 3D in order to create a highly detailed master mould. Ubisoft provides a weath of reference materials that were used when creating the video games. The 3D artist then creates an incredibly accurate model that will be refined with Ubisoft to capture all the details that define the character. Artists then ​paint each cast figurine with the utmost precision to reproduce faithfully all the details of the outfits and weaponry. within the Assassin's Creed Universe. ​Each magazine also contains character profiles, detailing the weapons and abilities of each individual character. Learn more about the friends and enemies, journeys and challenges of your favourite characters. Dive into the world of Assassin's Creed, and discover the truth about the Brotherhood.